Line 2 large cookie sheets with cooking parchment paper. Insert candy cane in center of flat side of each marshmallow to within 1/2 inch from bottom. In medium microwavable bowl, microwave chocolate chips uncovered on High 45 to 60 seconds, stirring every 15 seconds, until melted and smooth. 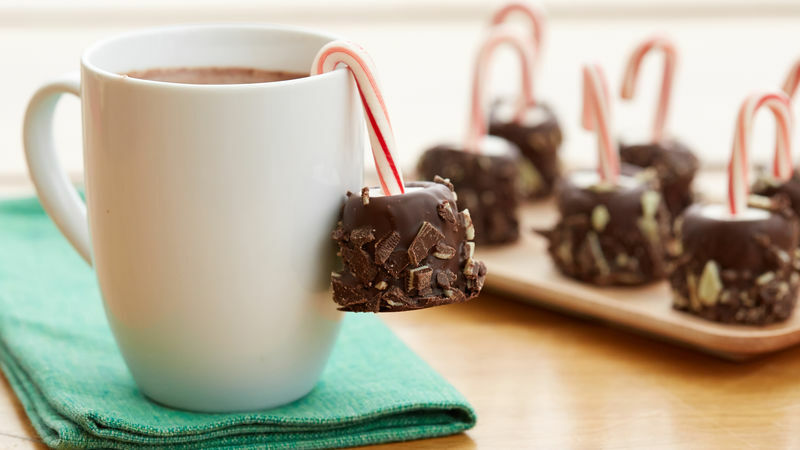 Using candy cane for handle, dip marshmallows into chocolate to coat. Let stand 2 minutes on one of the cookie sheets. Sprinkle marshmallows with chopped mints. Place flat side down on remaining cookie sheet. Refrigerate about 15 minutes or until chocolate is set. Substitute Andes™ mint parfait or peppermint thins for the Andes™ crème de menthe thins in this recipe. In a hurry? Andes™ crème de menthe or peppermint crunch baking chips may be substituted for the Andes™ crème de menthe thins.